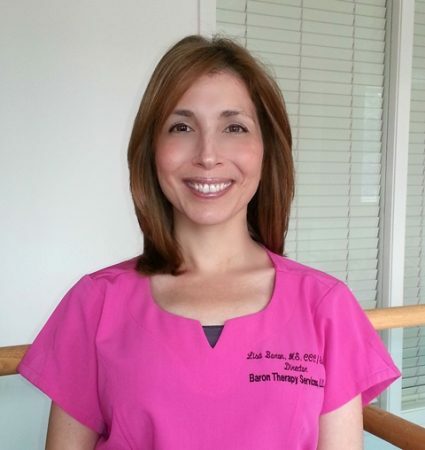 Hi, my name is Lisa Baron, MS, CCC/SLP. I have over 20 years of experience working as a speech-language pathologist and as the Director of a multi-disciplinary team of dedicated and caring therapists. I’ve had the privilege of working with children and young adults of all ages. My areas of specialty include motor speech disorders (apraxia and dysarthria), feeding problems, autism, and language. I also coordinate and follow all aspects of care for patients. I am a strong advocate for children and their families. I’m passionate about helping children communicate, and develop successfully. I use my knowledge and years of gathered clinical experience to provide the highest level of care possible to all children and their families. My father was a pediatrician and my mother was a teacher and nurse. They were incredible mentors to me throughout my life. I grew up in a home where both my parents supported and taught me work ethics and values. I often sat in my mother’s classroom to watch her teach. I was always amazed at how she engaged her students, sparked their curiosity, and love of learning. I frequently joined my father on rounds at the hospital. As an Associate Clinical Professor at Yale, he had experience with shaping young professionals. He has been an excellent teacher to me. I had the advantage of furthering my medical background beyond the offerings of my formal schooling. I was fortunate to be taught so closely, and find the field that seemed custom made for me. Every day I am excited to go to work. To unlock the voice of a person in need and strengthen their abilities to function in life is precious, affirming, connecting, and ensuring of the future. The opportunity to practice my profession is truly a blessing. In addition to providing care for children and young adults, I’m dedicated to teaching others and continuing my own education. I’ve supervised graduate student clinicians in their fieldwork and graduated fellows while completing their clinical fellowships. I’ve also been awarded many credits beyond my master’s degree for completing courses and participating in conferences. Licensed from the Connecticut Department of Health as a speech-language pathologist.